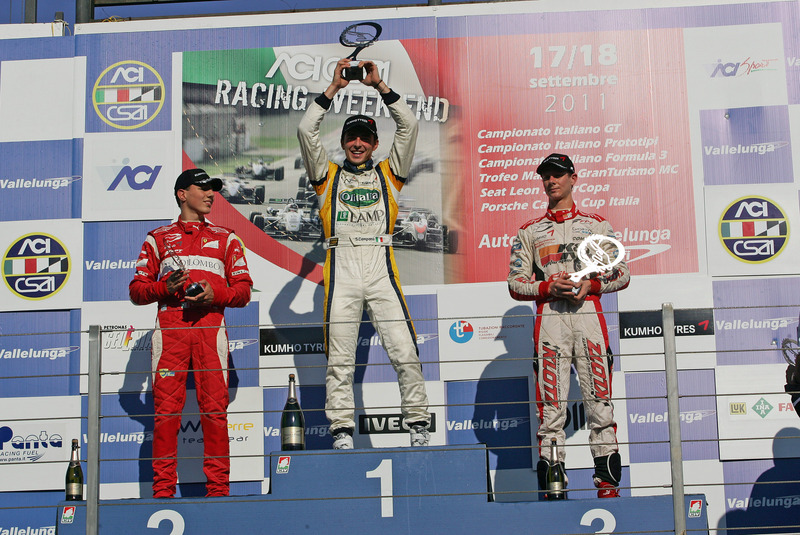 17/09/2011 - Thanks to a great start taking him to the lead of the pack, Sergio Campana secured the victory in Vallelunga's race one valid for the sixth round of the Italian Formula 3 Championship. On the circuit named after Piero Taruffi, the driver from Modena overtook the poleman Raffaele Marciello (Prema Powerteam) and then put the hammer down setting a sequence of fastest laps to gain a security margin on the rivals. During lap eight, after a radio communication with the team alerted by race director of a possible jump start, Campana allowed the young Swiss of Italian origins to go through at the hairpin but then gained rightfully the lead again in the following lap. On the third place of the podium, mirrored by the third position of the classification, was the Californian Michael Lewis (Prema Powerteam), while the Milanese Kevin Giovesi (Lucidi Motors) managed to recover up to the fourth place during lap one after starting from the ninth spot on the grid. After losing the fourth place in qualifying, the Roman Edoardo Liberati (Team Ghinzani) recovered up to fifth and, as the French Brandon Maisano (BVM-Target), managed to overtake Victor Guerin (Lucidi Motors) only in the final part of the race and the latter was therefore relegated to the seventh place. Thanks to the results of qualifying and race one of the sixth round, the classification now sees Campana strenghtening his lead at 107 points, followed by Marciello (-12) that in the rookies classification leads to the French Maxime Jousse (BVM-Target), as the latter was forced to retirement today due to a contact with Eddie Cheever (Lucidi Motors). Third position in the championship for Jousse (-22) followed by Maisano (-24), Lewis (-25) and Liberati (-27). The appointment is now for tomorrow's race 2 at 10.10 (local time, GMT+2).